I took a day of vacation to go to the Joint Services Open House with the museum. It was a rough morning - - I had to be at the museum at 0645. I'm usually just getting into the shower at that time. Somehow I made it there in time. Whew! Maybe I should try getting up this early again and going to the gym....hmm, I said 'maybe'. 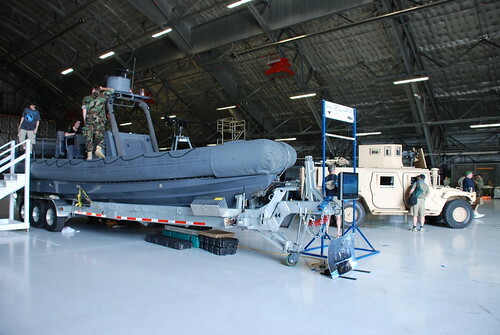 The Joint Services Open House is held at Andrews Air Force Base. I haven't been there in several years. When we arrived at the gate to the flight line, we were denied entrance. But we have the pink pass, our Marine driver argued, we were told yesterday that that would get us to the hanger, we have stuff to drop off. The Air Force security guard told us the pink pass was only good until 7 a.m. that morning. Phone calls were made to find who had a red pass to bring to us. We were directed to go to the operations office since the Marine who had the red pass was at the safety briefing. As we were leaving the parking lot, we hear the MP tell another government vehicle they couldn't drive onto the flight line unless they had a green pass. What the heck? So that was the joke the rest of the day - - what color pass do we need now? Well, gosh darn it. I got a large shirt so it wouldn't gap in this area! So all I wanted to do the rest of the day was stand there with my arms across my chest. 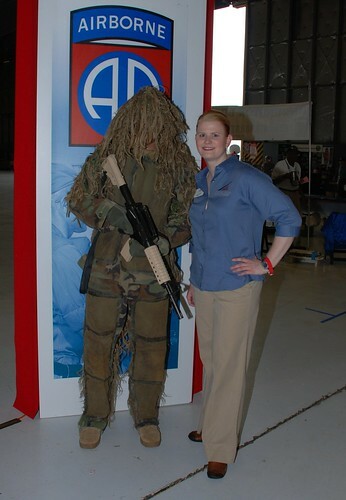 Before the air show opened, I walked around with one of the gals who works at the museum. 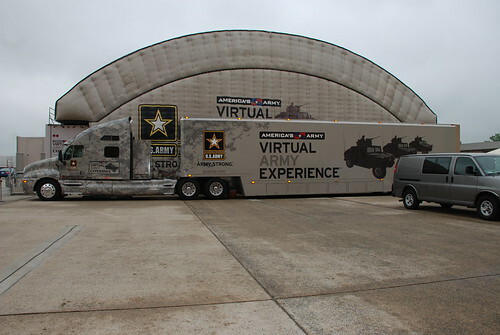 We headed over to check out the Army's Virtual Army Experience. While we were waiting in line, the Public Affairs officer came up to us and asked if we wanted to take pictures of what was going on inside. "Well, sure if we can." "You can with me." He said. As you can see, it is surrounded by video screens. 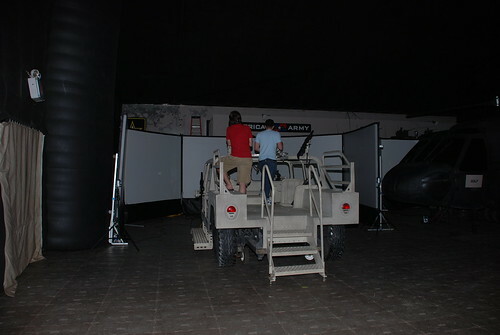 These screens project a computer generated display as if they were driving through an Iraqi village when all of a sudden, they are ambushed. The targets in this station looked like people. In another station, the targets were little red Xs. 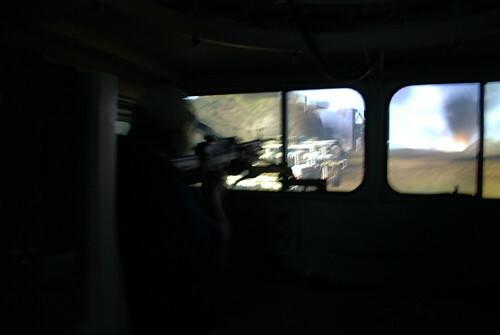 I sat in the back of one of the Humvee in an attempt to get some pictures of the action. You really feel like you are moving when you are sitting in the vehicle. I'm sure this will be very popular. When we left, I felt like I was deaf - - so it is quite loud. 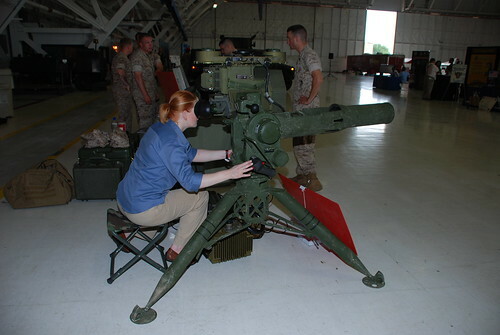 Here I am checking out the sites on a Sabre missile system that the Marines from The Basic School (TBS) brought with them. This weapon is usually mounted on a Humvee. 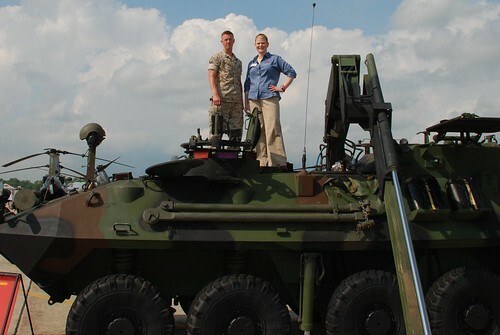 Here I am on a Marine Corps LAV. Below, the navy SEALs stuff. I listened to the SEAL discussing submersible training to a woman and her teenage son. I was curious and asked if that type of training was what a SEAL recently died participating in. Yes, the SEAL said. He had been with the family that week and the funeral had been today. O.k. I felt like a jerk. I told him I was so sorry. I know, you are wondering, if this is an air show, where the heck are all the aircraft? Well the Thunderbirds performed this year. 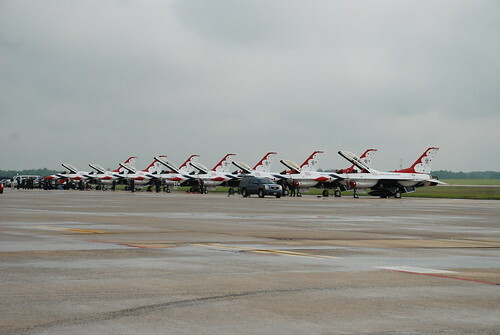 Typically, the Air Force's Thunderbirds alternate with the Navy's Blue Angles at this air show. 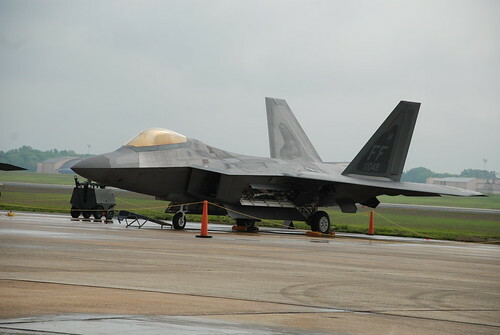 This is an Air Force F-22. Recently, the DoD cut funding for this program and will not be producing anymore. Instead the DoD will be concentrating on the Joint Strike Fighter aka the Lightening II. 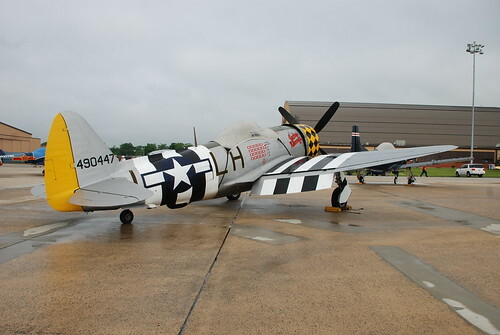 Of course there were many antique air craft as well as all the aircraft currently used by the US military. I am actually surprised that there aren't foreign military participants in this air show. 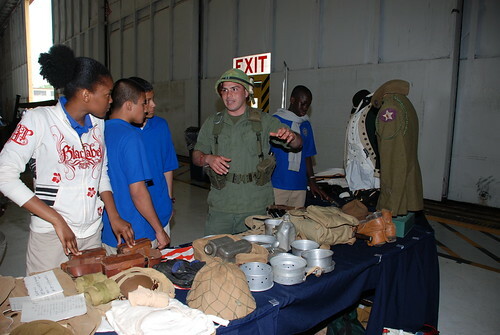 This is one of our Marines telling some interested students about the history of the Marine Corps. He is dressed as a Vietnam era Marine. 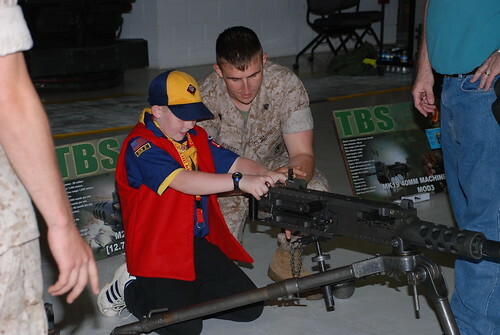 Here, an instructor from TBS shows a young Marine fan how a 50 caliber machine gun works.